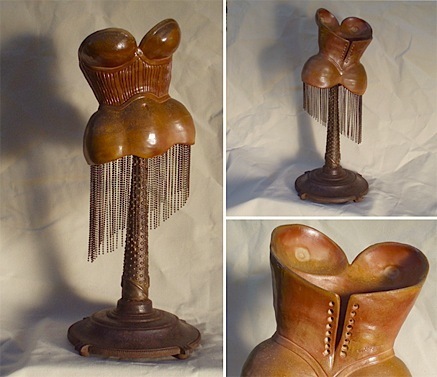 Shown here is a sampling of recent works, including functional vessels, wearable art, figurative sculptural pieces, and whimsical (some say non-sensical) artifacts. 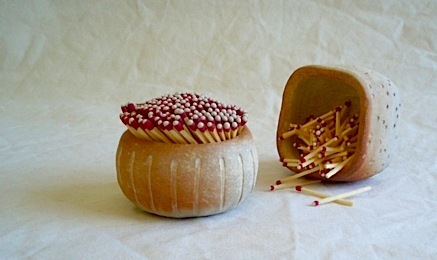 Most works are one of a kind, though some pieces are created in small thematic series. Various pieces are available through commercial galleries; the artist also sells direct (contact Evelin to arrange a studio visit to Winnipeg Beach) and welcomes commissions (e.g. 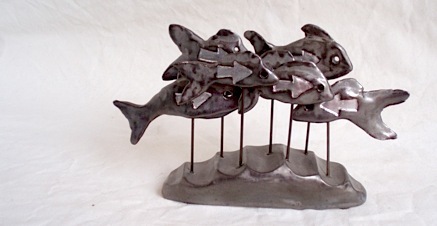 custom creations for special occasions, corporate gifts, etc.). 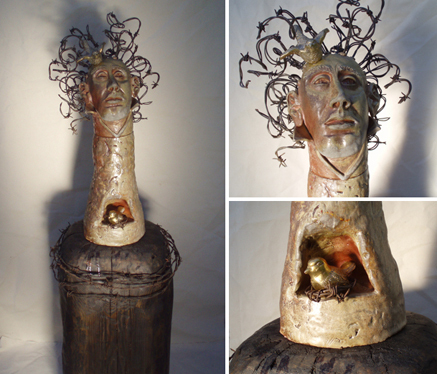 Home To Roost A figurative coil-built sculpture in stoneware, wood-fired with various stains and glazes, incorporating brass birds and salvaged barbed wire, on a wax-finished dock-post base; 440mm x 420mm x 1420mm high (plinth height 770mm). This is the largest piece I’ve made to date—wood-firing is somewhat unpredictable… I was particularly pleased with the ash deposits and natural flashing (colouration) on this piece. 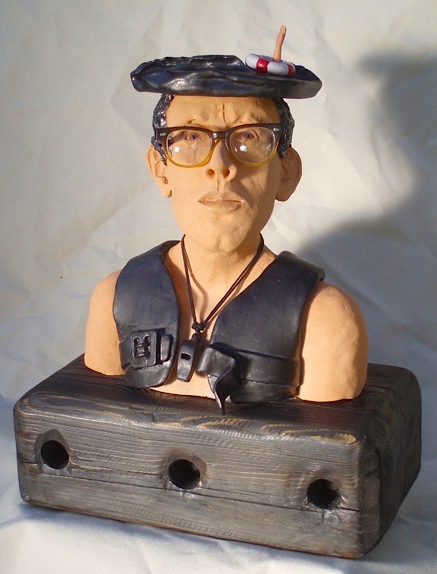 Third Time Lucky A figurative slab-built stoneware sculpture, finished with burnished steel low-fire glazes and iron oxide stain, with found porcelain hand and bifocal eyeglasses; 430mm x 230mm x 545mm high. 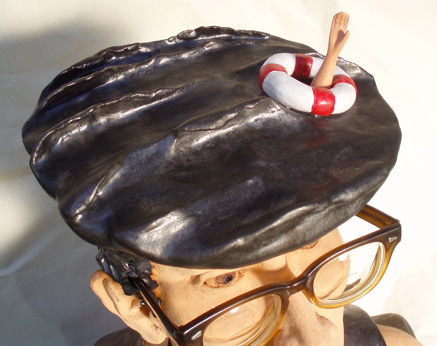 Beach safety is always top of mind when living in a lakeside community… combine this with the fear of myopic perspective and you have ready-made irony within reach. 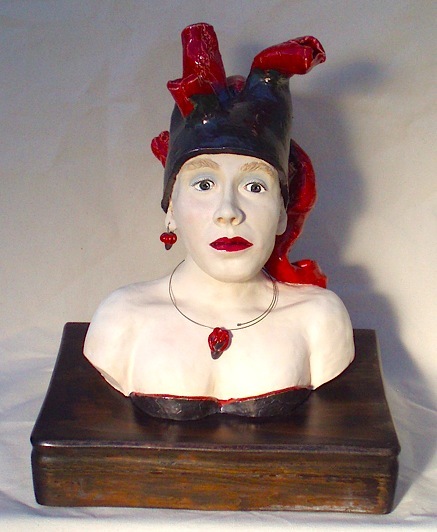 Wallflower A figurative coil and slab-built sculpture in stoneware, finished with low-fire glazes, cold-finished, with matching ceramic jewelery, on a re-purposed flatware chest; 385mm x 340mm x 460mm high. Are you there? 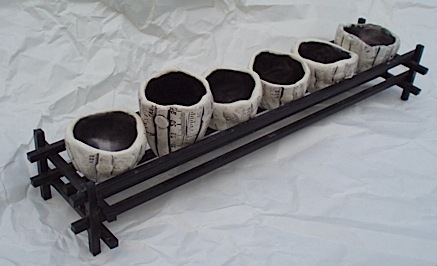 A figurative slab-built piece in stoneware, finished with various stains and low-fire glazes; 170mm x 80mm x 170mm. 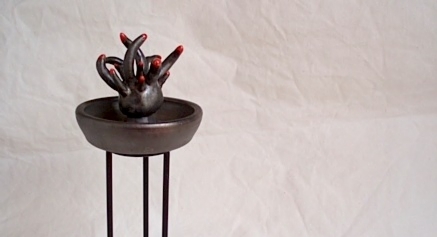 Above: Nebulous Reservoir, 120mm Ø x 320mm high (on iron stand); With the flow?, 250mm x 60mm x 150mm (stoneware with metal posts); Is anyone listening?, 120mm x 155mm. 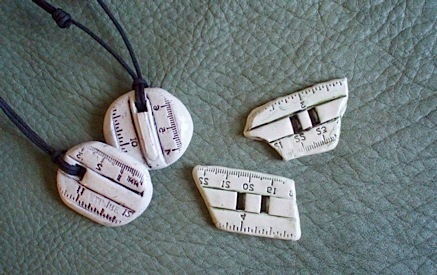 Measure for Measure, 250mm x 75mm x 90mm high (in iron rack; food-safe glazes allow for use as shot-glasses). 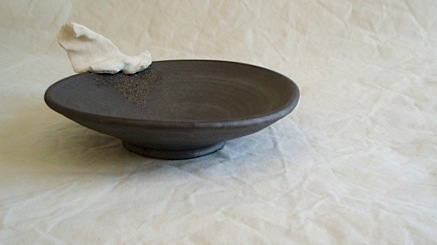 All pieces hand-built stoneware with low-fire Cone 04 glazes in burnished steel and sea anemone. 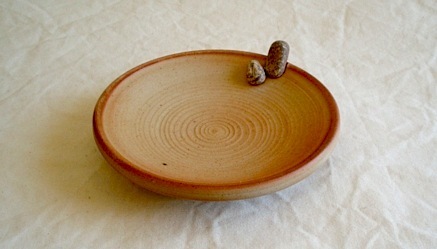 Above: Zenish (selections from series); generous thrown stoneware basins and vessels (200mm to 250mm Ø for bowls, 90mm Ø for match-bowls) fused with merged beach findings (coral and/or pebbles); some low-fired to Cone 04 with burnished steel glaze, others wood-fired to Cone 12+ (unglazed, but flame-kissed with warm blushes and ash). 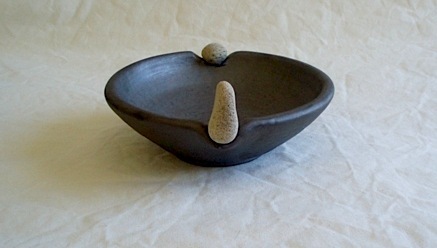 Above: Tidal Pool Urbane, thrown stoneware basin 245mm Ø x 85mm; art object 30mm x 50mm hand-built stoneware with sheepskin nest-base; Questionable Motive?, thrown stoneware basin 250mm Ø x 90mm; 60mm Ø tactile orbs of hand-built stoneware; Phylogenic Wrap, hand-built stoneware vase, 85mm Ø x 190mm; Mantra (pendent on waxed cotton cord), 20mm Ø x 25mm hand-built stoneware. 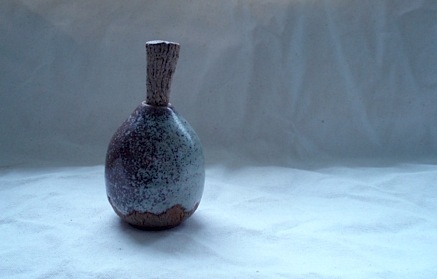 All pieces low-fired to Cone 04 with burnished steel and sea anemone glazes. 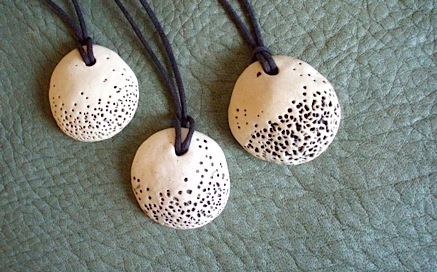 Here’s a sampling of the many types of necklaces, pendents, and distinctive buttons that have proven to be popular over the past years. 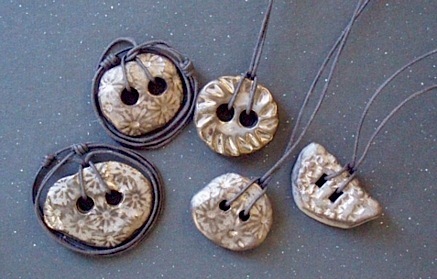 If you’re a fiber-artist or fashion designer looking for unique ornamentation, or you just want to replace those ugly plastic buttons on your favorite sweater… let me know. 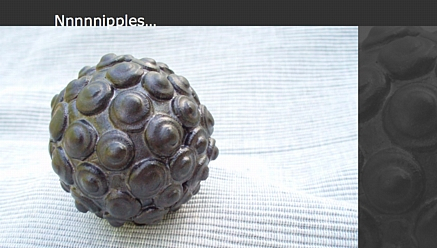 Above: Strangely Eager, 65mm Ø; Pierced Entry (bowl), 100mm Ø x 60mm; Nnnnniples, 60mm Ø. 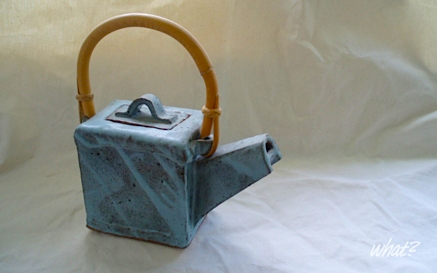 All art objects retro-formed stoneware with low-fire Cone 04 glazes in burnished steel. 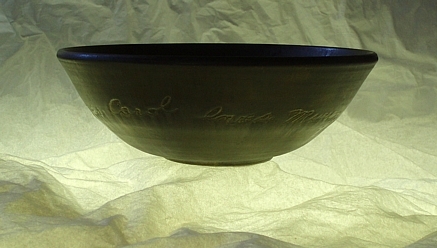 Love You Forever… This generous bowl was a commission to celebrate a 40th wedding anniversary. 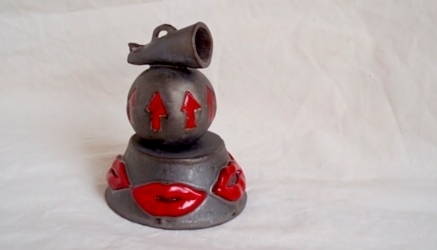 It bears a subtle yet perpetual message inscribed around the circumference (you feel it before you see it)— “…Carol loves Murray loves Carol loves Murray…” (250mm Ø x 85mm thrown stoneware with low-fire 04∆ burnished steel glaze, hand-crafted wooden gift box). 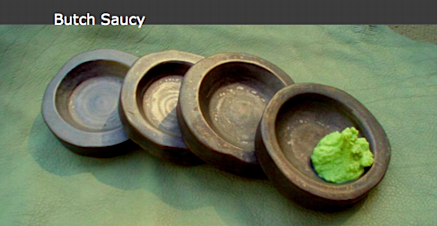 Above: Butch Saucy (sushi bowls); 90mm Ø, retro-formed stoneware with low-fire Cone 04 glaze in burnished steel. 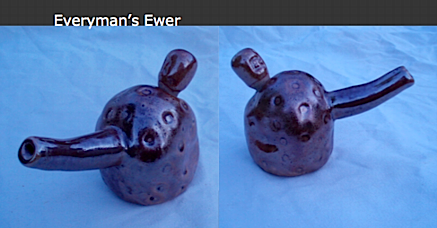 Everyman’s Ewer, 80mm Ø, 65mm spout, hand-built stoneware with carbon trap glaze gas fired to Cone 10. 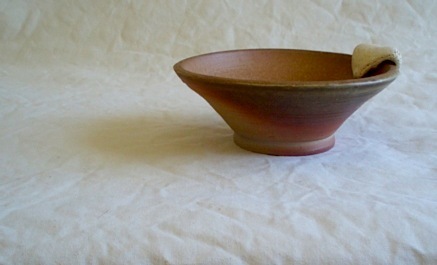 Buttoned Yoke (pedestal bowl), 85mm Ø base, 340mm Ø top, 140mm high, hand-built stoneware with low-fire Cone 04 glaze in burnished steel and ruby. 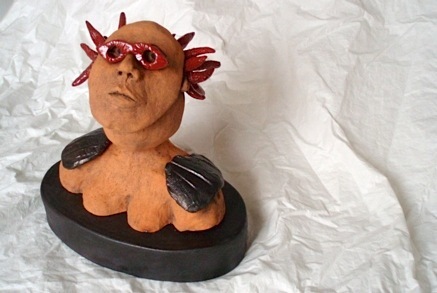 nowadays I revel in clay-play. 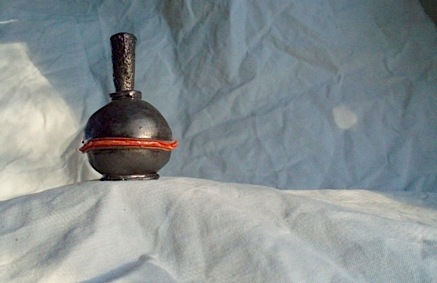 Above: Stop Her (scent vial), 30mm Ø x 40mm, thrown stoneware with tea glaze gas fired to Cone 10, unglazed stopper; Ode (scent vial), 45mm Ø x 40mm, thrown stoneware with low-fire Cone 04 glaze in burnished steel and ruby detail, glazed stopper. 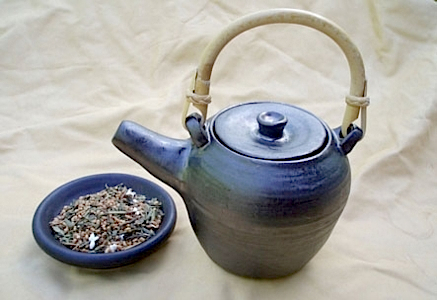 Above: Chunky Sky, hand-built stoneware teapot in robin-egg glaze gas fired to Cone 10; Camelia Sinensis, 100mm Ø x 75mm, thrown stoneware teapot in burnished steel glaze electric-fired to Cone 04; Genmaicha, 105mm Ø x 105mm, thrown stoneware teapot in burnished steel glaze electric-fired to Cone 04. 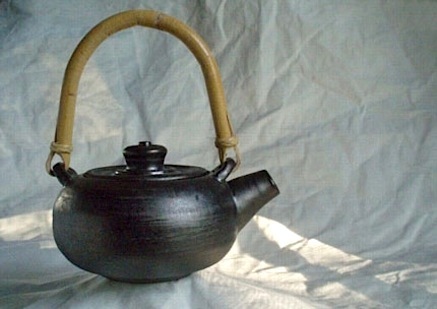 All have integral strainers and bamboo handles. 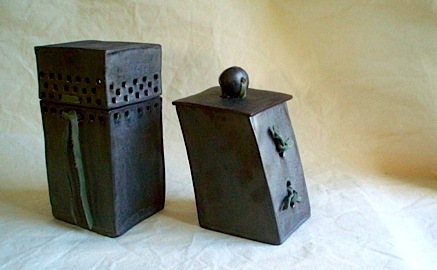 Above: Hidebound Too, slab-built stoneware container, 105mm x 95mm x 240mm, low-fired Cone 04 burnished steel glaze, green leather hinge and closure; Somewhat Reclined, slab-built stoneware container, 90mm x 75mm x 200mm, low-fired Cone 04 burnished steel glaze, green leather trim.